Lets you select the Storyboard Pro project files to merge with your current file. Lets you reinstate a caption if you selected a caption for removal and changed your mind. Lets you remove captions to prevent them from being imported into the merged project. Removal will be indicated by highlighting that caption in grey. Lets you move the caption text around. If you move a caption from a certain project to a blank row, a new field will be created for this text in the project’s panel window. By default, scene numbers will be updated to avoid numbering conflicts, however you can force the scene's numbering. If the Force scene numbering option is selected, enter a number in this field. The number you enter will be assigned to the first scene in the import project list section above. Uses the imported project’s name on all scenes in the new merged file. The scene‘s new name will be its number in the merged file, prefixed by the file it originated from. 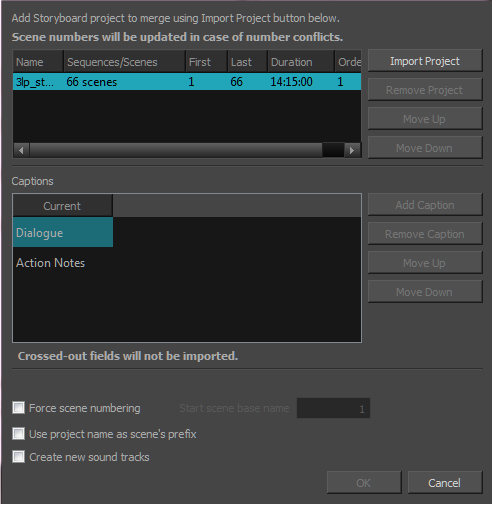 Places the sound element from each imported project in a separate soundtrack (row) in the Timeline view. Otherwise, all the sound elements will appear in the same soundtrack in the new merged project.